If you've worked as a Retail Sales / Retail Assistant, Sales Assistant / Sales Rep / Salesperson / Sales Consultant, Restaurant Waiter / Waitress / Waitperson, Hospitality / Bartender you probably have skills that are suited to the role. Roles are currently available in and around Geelong. We are well-known for our strong culture, fun people, global footprint and exciting career opportunities – plus we sell the most exciting, and the best product in the world – travel. Do you want to share your real passion for travel with other travellers and holiday makers every single day? Our Travel Consultants, craft personalised travel experiences for our customers by building strong relationships to really understand what our customers are looking for in their next holiday. Right now we are on the lookout for travel-loving people to be an integral part of our customer's travel experiences by becoming Travel Consultants. Your first four weeks will be spent soaking up information provided by our award-winning trainers in Welcome Aboard training. Here you'll learn about our fantastic product offering, how to use our booking systems and our steps to providing a fantastic customer service and sale process. What work perks will I have access to? If you are ready to launch your career with Flight Centre, apply today. 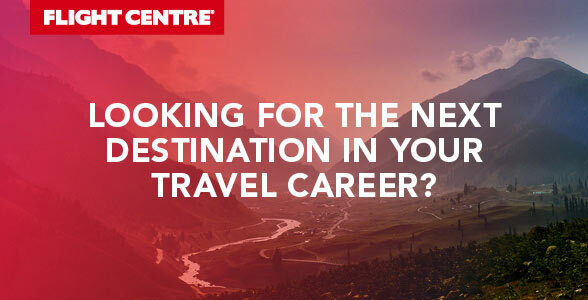 Please note: You need only apply for one role with Flight Centre Travel Group as the Recruitment Team will consider your application for all brands and businesses within the state or territory that you have applied for. At Flight Centre, we are well known for our vibrant culture, fun people, global footprint and exciting career opportunities – plus we get to sell the most exciting and best product on the planet – travel!